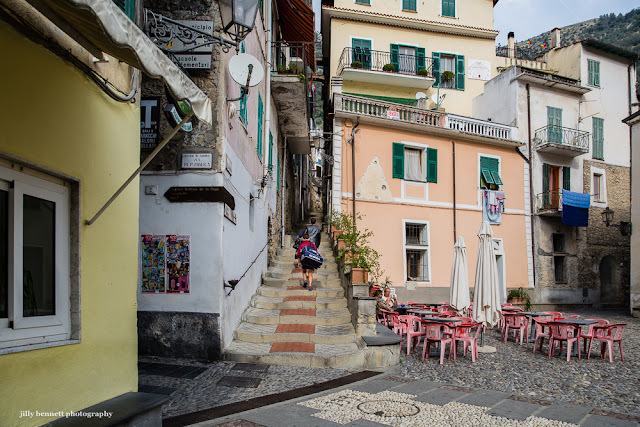 Airole, in Italy, where some people have a lot of steps to climb to get home. Aren't the steps interesting? Note the curve in each one. Airole , en Italie, où certaines personnes ont beaucoup de marches à gravir pour rentrer chez elles. Ne sont-elles pas originales ces marches? Notez la courbe de chacune d'elles. I do like it. It looks like one certainly can get a whole lot of exercise there! You'll never see a town like that in this country. Were the steps built that way, perhaps for drainage, or is it years of wear?